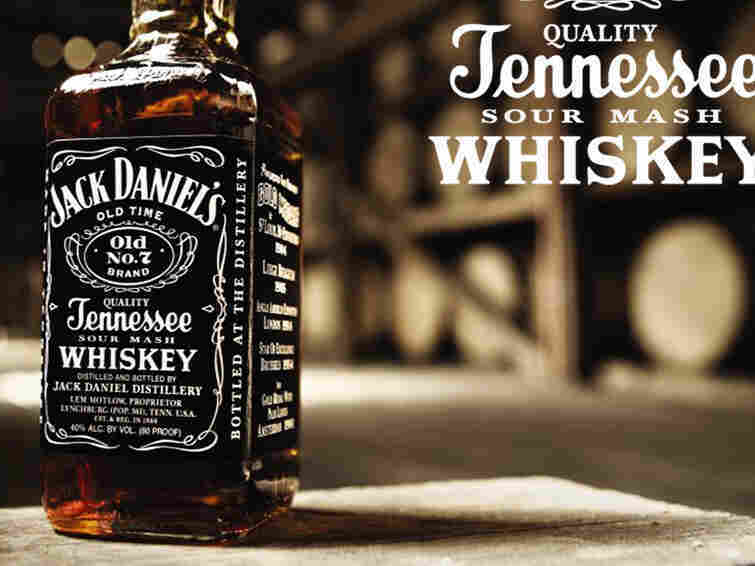 Distilling Jack Daniel's ... Label : Blog Of The Nation Jack Daniel's is tightening up the text-heavy label for its Old No. 7 whiskey. The company is nixing some half-truths and exaggerations that have been on display for decades. The changes have prompted some controversy among the faithful. The famous square bottle for Jack Daniel's Old No. 7. The company is tightening up the black and white label. Lynchburg (Pop. 361) TENN. U.S.A. It turns out we've been drinking up exaggerations for some time now. Lynchburg, a dry town for more than a century, last had a population near 360 in 1920. On the side of the square bottle, instead of awards will be a short history of Jack Daniel, whose name was actually Jasper. And Lemo Motlow, a Jack Daniel's heir who kept the company afloat during Prohibition, will no longer get credit for his work. According a fun Wall Street Journal story, that's got some people upset. Over iced-tea at the Bar-B-Que Caboose Cafe on Lynchburg's square, Joel Pitts said, "I can understand taking that 1866 off — and the population, too. Because they're wrong." He took a sip. "But taking the Motlow name off the bottle? I disagree." Mr. Pitts is 48 years old and belongs to the International Society of Jack Daniel's Collectors. His great-grandfather, Spoon Motlow, was Lem Motlow's brother. Lem inherited the distillery when his Uncle Jack died in 1911. His name went on the bottle. Through prohibition, Lem Motlow kept Jack's whiskey alive, if not flowing — even after he shot a man on a train while drunk in 1924. (He was tried for murder and acquitted.) Lem died in 1947, and his four sons took over the management. "If it wasn't for Lem, there'd be no Jack Daniel's," said Mr. Pitts, as Candy Richards approached his booth with a tea pitcher. "Lem off the bottle?" she said, pouring his refill. "You never know what the corporate's going to do." New label or otherwise, count me as one of the millions who'll turn a blind eye to the exaggerations and half-truths. I'll raise my glass to a slice of Americana.